The Lab has recently released a new menu to include more fresher and local produce, with a wider range of dishes to please the crowd. As the name suggests, The Lab has a wonderful science/chemistry theme; with beakers in place of drinking glasses being just the beginning of the fun décor. The new menu has only been out for two months so make sure to come and see what new delicious treats The Lab has to offer. 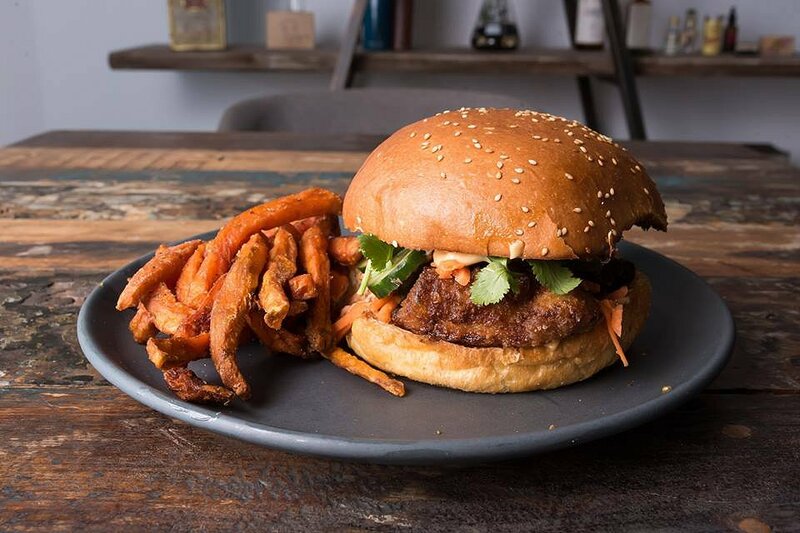 The Karaage Chicken Burger is served with fried chilli and shallot mayonnaise, cucumber, pickled carrot and coriander. The burger is filled with lovely fresh salad and soft, tender chicken. The chicken’s skin was crispy with a tang from the sauce and heat from the fried chilli. The crisp lettuce cooled the spice from the chilli and overall the dish held a beautiful combination of textures and flavours in the one bite. Served with fries on the side, this was a very satisfying meal and a great start to our day. The Lab Burger was a meal and a half. The house made beef patty with cheese, tomato, lettuce, onion rings, pickle and dirty sauce made for the perfect balance of flavours. I would recommend that you double up the fresh and colourful dish, because everyone knows it’s not a real burger until you have two whole beef patties in the middle. The flame-grilled beef gave off a nice smoky flavour and with the added melted American Style cheddar cheese on top of the patty; you will get the creamy, gooey texture that makes you salivate after every bite. 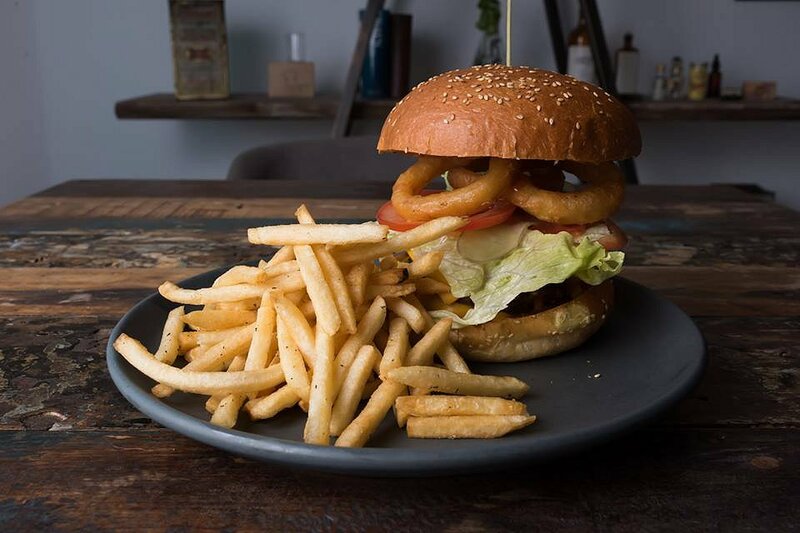 The onion rings were the perfect additive to the sweet and smoky flavours, with the tomato and lettuce adding the fresh and cool elements to the meal. The creamy mayonnaise and sweet relish was the perfect flavours to tie the whole dish together. The huge dish was filling and delicious. The only problem you will have is fitting the whole burger in your mouth for a bite! 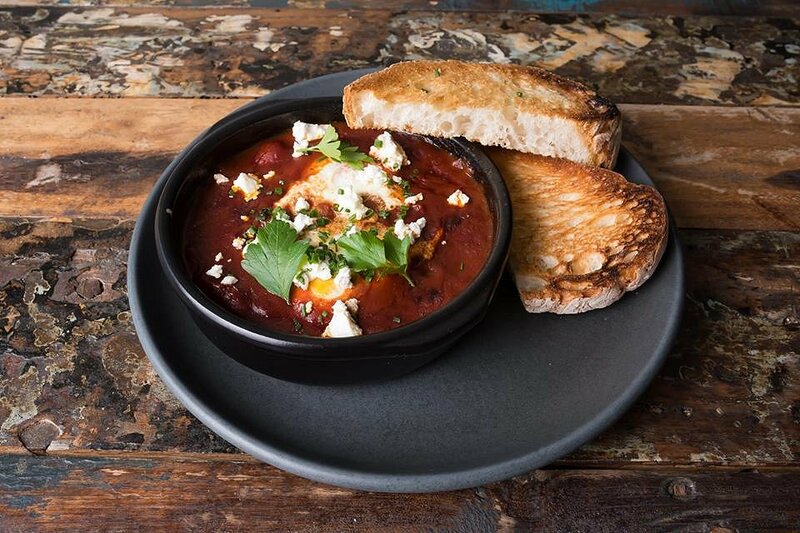 The Rich Baked Eggs contained two free range poached eggs in a rich tomato sugo with Barossa chorizo, feta, fresh herbs and toasted ciabatta on the side. The whole dish gave off a Middle Eastern vibe with its hearty and rich flavours and textures. The soft baked eggs were complimented by the rich, thick tomato sugo, while the fresh herbs, softened the rich flavours and led to a balanced dish. The toasted ciabatta bread was perfect to dip in and added a lovely crunchy texture to the baked egg dish. The toasted bread was also the prefect way to soak up the leftover thick tomato sugo, helping you to get every last bit of sauce. The Unsmashed Avo is a lovely and healthy dish. The sliced avocado is served on a rye sourdough with beetroot relish, heirloom tomatoes, dukkah, fig vincotto and snow pea tendrils. We also opted to add haloumi to the dish and I would definitely recommend that for anyone who loves cheese. The beetroot relish was beautiful and held a sweet tang, while the cheese gave a fresh, creamy flavour that was also supported by the snow peas and the tomatoes. The haloumi was not too salty and paired nicely with the creamy Avocado and the sweet tang from the roasted tomatoes. The dukkah also gave off a deeper nutty flavour that again complimented the Avocado and the rye sourdough bread. The dish held a wonderful balance of flavours and textures of the crunchy rye with the smooth avocado and relish. The traditional smashed Avo dish is modified to be a unique dish that you can only find at The Lab. The Unsmashed Avo was delicious and was one of my favourite dishes of the day. The Caramelised Pumpkin Bowl is a great dish for someone who wants to have a healthy meal and not be worried about affecting his or her diet. 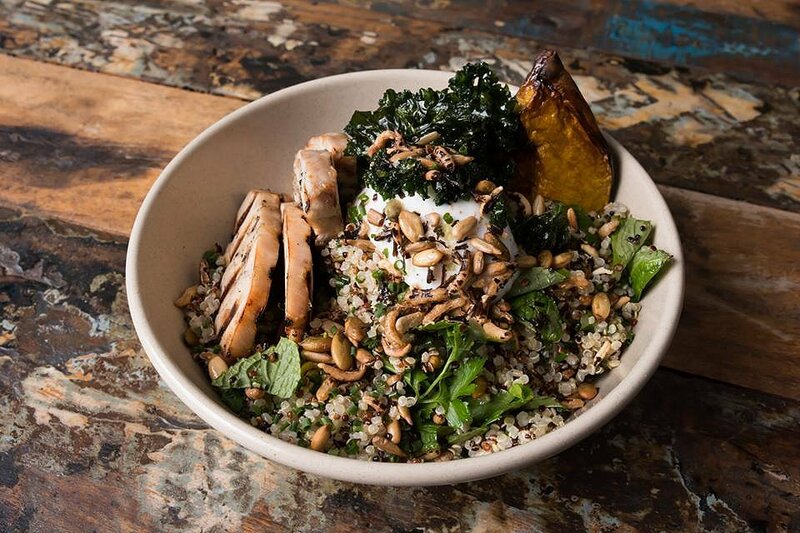 The roasted pumpkin was served with crunchy kale, quinoa, puffed seeds and rice, coconut yoghurt, herbs and a honey balsamic dressing. We also opted to add grilled chicken to the dish. The warm pumpkin was beautifully paired with the cool sweet coconut yoghurt, while the quinoa and seeds gave a lovely crunch and nutty, earthy flavours that balanced well with the other flavours and textures. The crunchy kale also added a lovely freshness to the dish. The grilled chicken was cooked well and the tender meat paired well with the soft savoury tones of the pumpkin. The overall dish definitely made you feel healthy and encouraged to do more clean eating if it all tastes this good. The Lab Waffles were another favourite of the day. 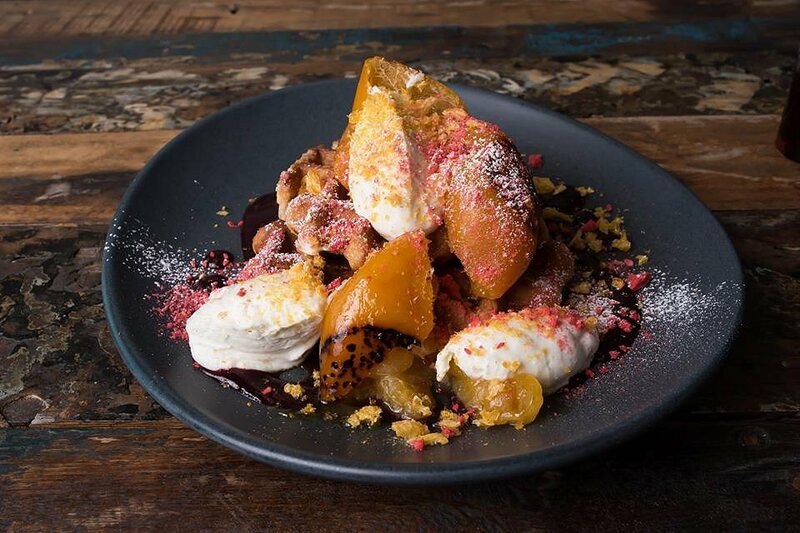 The Belgian style waffles were served with candied mandarin, whipped ricotta and raspberry. The dish was stunning to look at and we didn’t want to disturb it by cutting into the sweet waffles. The chewy and slightly crunchy waffles paired well with the tang of the candied mandarin and the sweetness of the added maple syrup. The cheesiness of the whipped ricotta was my favourite element of the dish and would gladly buy a whole tub of that to eat. Not overly savoury and still sweet, the ricotta was light and balanced the stronger, tangy flavours of the mandarin and the raspberry. This dish was delicious and we could not stop eating. The French Toast was another delicious dish that where we could not put down our spoons. 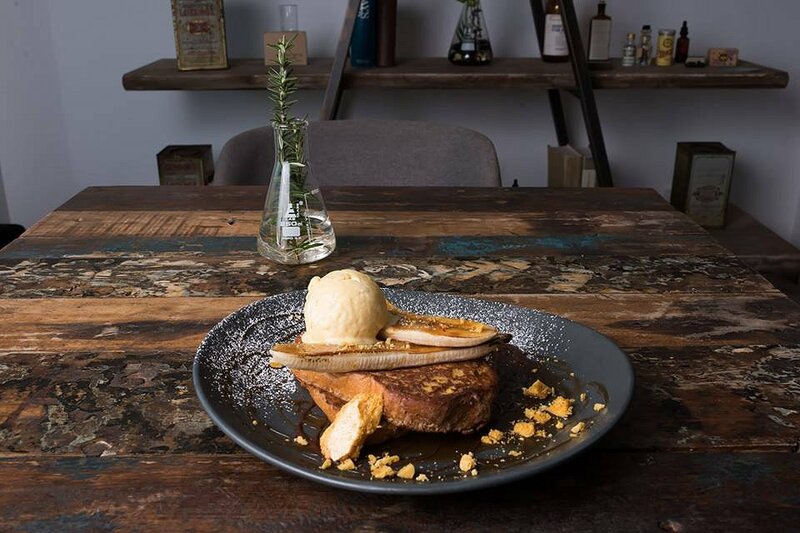 The Brioche toast was paired with caramelised banana, cinnamon parfait, slated caramel and honeycomb. The presentation again was stunning and the dish contained many different textures and complimenting flavours. The soft bread was paired well with the chewy sweetness of the honeycomb. The warm banana with the hard caramelised top was beautiful and rich and was a lovely texture change with the soft banana and the hard caramel. The dish was sweet but wasn’t too overpowering having just the right savouriness with the brioche. All dishes were not only very delicious; containing many fresh ingredients that were combined together wonderfully, but were very pretty and photogenic dishes. And for those that have a sweet tooth, both deserts would surely exceed even the toughest of critics’ expectations. Head Chef, Matt Wishart, makes all the dishes with lovely fresh and local ingredients, to ensure customers are getting the best food when they come visit The Lab. “I grew up in McLaren Vale, so coming from all that I wanted to make sure everything is locally sourced and of good quality,” he said. You can tell the time and care that was put in to create The Lab’s new delicious menu. With a wide range of dishes, from traditional ones to unique and different, the variety on the new menu means there will be something to keep every customer happy. Chef Wishart would like to keep making changes to the menu and keep experimenting to compliment the ‘lab’ theme of the restaurant over time. 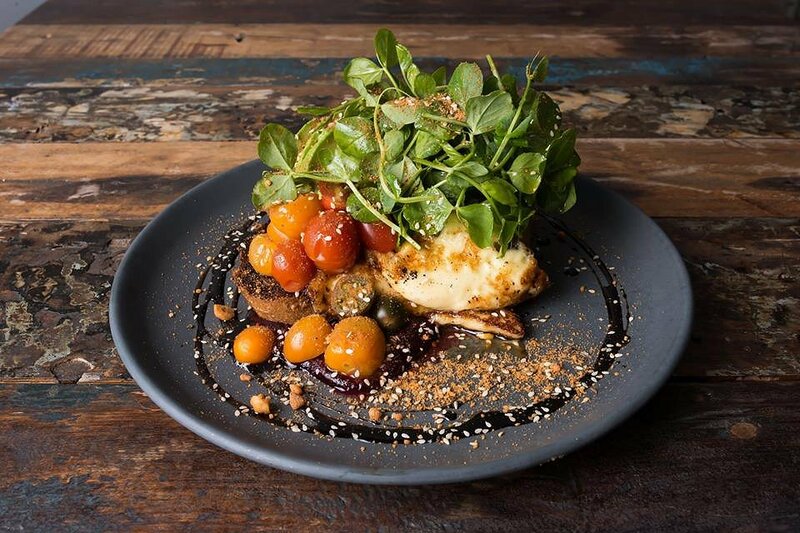 With its quirky and rustic style, The Lab is a wonderful place to catch up with friends over a delicious meal …or two. The Lab is open Monday to Friday, from 7:30am to 3:30pm, and on Saturdays from 8:15am till 2pm. The Lab will treat you to wonderful dishes, great service and a fun atmosphere; so why not try out their new menu today?